How is Benedict Subaru dedicated locally to the Love Promise? Benedict Corporation is proud to support the South New Berlin Fire Department, as well as the North Norwich Fire Department as our "Share The Love" hometown charities. We were able to provide over 100 warm winter coats to the Norwich City School District with our dealership coat drive. 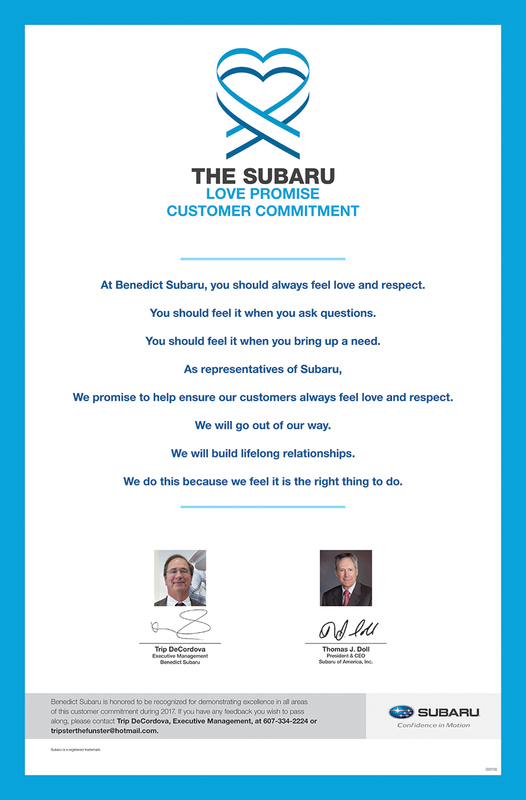 Did Benedict Subaru go above and beyond, provide exceptional service, or support causes that are important to you? We'd love to hear about it. Here is my story, sad but true. On Tuesday, September 26th I was enroute to Vineland, New Jersey to visit relatives. I had intended to make this trip weeks before but my 2017 Outback needed a transmission replacement. Around 9 a.m. my vehicle broke down on Route 12 south, between Norwich and Greene. I was unable to drive it in ANY gear. A flatbed arrived and transported the car to your dealership. Upon arrival there I had the good fortune to meet your Service Consultant, Connie Miller, who quickly gathered all the necessary background information. She assured me that everything possible would be done in hopes that my travel plans not be interrupted. She then provided a rental car so I could continue on. On my return trip to Norwich I picked up my car with the newly installed transmission. My thanks to Connie for her professionalism and compassion. She is truly a dedicated employee, one that kept me informed of every step in the repair process. Please pass along my thanks to Connie and the Service Department staff! My tire had a leaking valve stem which I discovered 2 days before an important trip. I called Subaru on Mon and although it was the last week of the month, their busiest time, they promised to fit me in on Tues. Tues morning came along with a power failure, luckily that only lasted 20 min and with a ride over to my job while they worked my repair in. All was completed by 1:30 and another ride from my job over to pick up my car. Many thanks to Connie Miller and the repair service staff for a job quickly done and for the chauffeuring to and from my job! Oh and that important trip...it was to babysit my grandson for 2 days 125 miles away. Label me a satisfied customer!